Most of the decisions we make about our future career and income potential are made during and right after we finish High School. This time of our life can be so important to our future, and yet many are unaware of the choices that are available to them. This online course will help you learn about these choices. You will learn about the difference between the various degree’s, certificates and training programs available to you as you explore the different career options available to you, including college, career, and the armed services. Know how to compare colleges and universities. Learn the differences between the military branches. Learn about the different career paths in the Armed Serves. 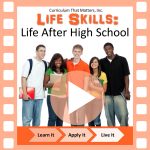 Learn about careers available to High School Graduates.